I ended my normal Saturday morning study routine early; headed to the beach, just me and my sailor star. We stopped off at one of those Indian River fruit stands, got some gas, headed out on 44 toward New Smyrna. We played in the water, made a sand castle, and had lunch at Manny’s Pizzeria. Little Marin, just four years old, asked if she could play the claw game in the arcade adjacent to the lobby. Manny’s is an old pizza parlor we used to visit during summers at New Smyrna. That machine has eaten thousands of dollars in silver coins over the years; some of that cash belonged to yours truly. Marin looked at me with all the seriousness of a second-string QB begging the coach to release her from the bench and win the game. I got three dollars in quarters changed out of a five. We paid for our pizza slices and headed into the game room. After it became apparent that I had a height advantage, I was entrusted with the joystick. Each play is fifty cents. What a rip-off, I thought. Then again, that was the whole point. “This is how they get you, Mare.” I wasn’t exactly the pinnacle of optimism. The first play wasn’t even close. It’s like the damn claw doesn’t even put forth the effort when you need it. It just goes all limp-wrist right when it catches and shakes it off, dropping it back into the stuffed animal pit. I imagined the claw turning its middle finger at me as it rides back to the starting point. Marin looked at me, anxiously. Her eyes fixated on the white bunny again as the claw began its final descent. Suddenly, it grasped onto the bunny with purpose; it pivoted back toward the drop box. I was certain it would fall and I’d have a crying four year old all the way back to Orlando. Only it didn’t fall until right over the drop box. 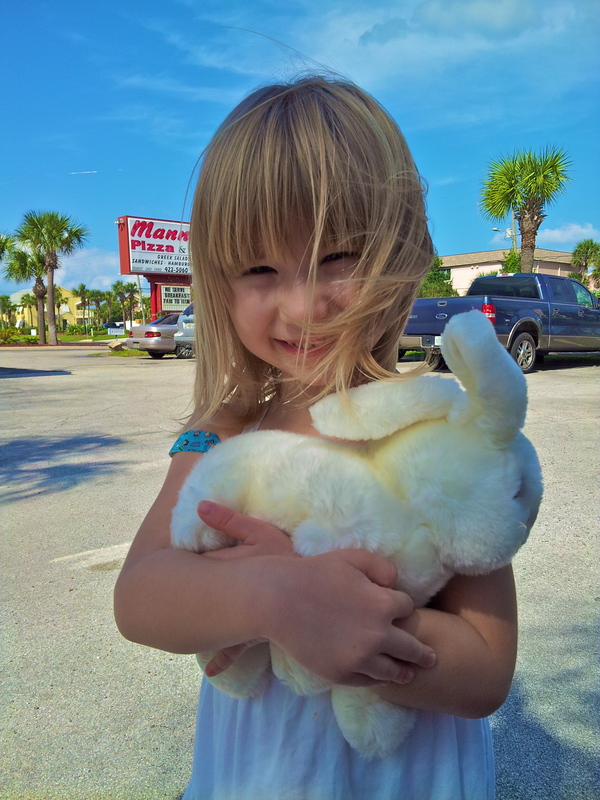 Marin grabbed the bunny out of the slot. It might as well have been a living creature. And that ladies and gentlemen, is the day I beat the stupid claw machine. Halcyon days! Congrats on the smash ‘n’ grab. I love it! The picture is perfect too.